There are plenty of magical––and funny (no, really)––moments throughout, enough that one can recommend this doc without reservation. It began with four notes and went on to sell more than 13 million albums worldwide. Having come off the enormously successful ride of Dark Side of the Moon, Pink Floyd decamped to a London studio to begin work on a follow-up release. But there were problems, including a scarcity of satisfactory material. The track “Shine On You Crazy Diamond”, which featured the four notes that came from David Gilmour’s guitar and which then fired Roger Waters’ imagination, was one of three that the group began to play live. It would become the centerpiece of the album, occupying––in various shapes––the whole of the record. It was also about the group’s fallen former leader and creative well, Syd Barrett, the man that the other Floyds had grown fond of until, by the end of the ‘60s, he’d become an acid casualty and unable––or unwilling––to deliver the kind of material that had brought the band much of its early acclaim. Like Gilmour’s four simple notes, Barrett had been the spark that caught wind and became the Pink Floyd fire. 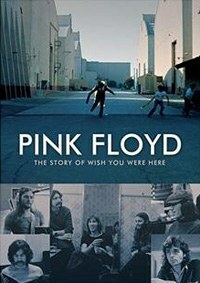 Certainly Wish You Were Here has its place in the hearts of Floyd fans––it doesn’t take the listener on a trip to the aural cinema the way that Dark Side does, and it’s not the ambitious concept record that The Wall would become, and its not the should-have-failed success that Animals is, either. It’s a strange record, short on actual songs and filled with tales of absence and longing for a return to something, anything that feels like home. Even David Gilmour’s guitar lines are more about what one doesn’t hear than what one does, and the echo-driven sound is filled with a longing and melancholy that haunts the listener. The three surviving Floyds––Gilmour, Waters, drummer Nick Mason––recall the sessions as being initially directionless, with a number of creative dead ends reached before the album took flight. It was in those sessions, we learn, that the divide between Gilmour and Waters really found its footing, and that Waters’ increasing alienation from the audience that helped build the Pink Floyd empire, was only beginning. Despite the slow start, the band managed to write a memorable four of its most memorable songs––including the titular track, “Welcome to the Machine”, and “Have A Cigar”, featuring the famous line, “Oh, by the way, which one’s Pink”? The song is sung not by the group’s two vocalists––Waters and Gilmour, though they tried––but by close friend Roy Harper. His presence, it turns out, remains controversial for a variety reasons, all of which are best left experienced by the viewer rather than explained by the writer. The greatest presence on Wish You Were Here, though, may be Barrett who was long gone from the band by that point. But he inspired “Shine On You Crazy Diamond” and, Gilmour says, is at the heart of “Wish You Were Here”, as well. He famously turned up during the sessions, a bloated version of his former, handsome self, a ghost that would continue to haunt the band all the way into the present. The tensions that eventually drove the Floyd to break up are not detailed here and for good reason -- those tensions are a necessary part of the creative process but not part of what the listener remembers or wants to hear when he plays the album. Thus, our memories are not sullied by recollections of internal squabbles or ego trips galore. Rather, the music remains at the forefront from start to finish. One of the more remarkable things about Pink Floyd is that for a band that was relatively faceless––this writer was a fan for half a decade before being able to tell the difference between Roger Waters and Nick Mason or David Gilmour and Richard Wright; it just never seemed to matter––the visuals that accompanied the music, whether via album packaging or films to accompany the band in concert, were of utmost importance. It seems only appropriate, then, that the team behind the visuals that would accompany this record is present. Designer Storm Thorgerson, album photographer Aubrey “Po” Powell and studio photographer Jill Furmanovsky all appear as does Gerald Scarfe––whose illustrations have become synonymous with Pink Floyd since the Wish You Were Here era, and are at the very center of The Wall. Engineer Brian Humphries offers insights, as do former manager Peter Jenner and late keyboardist Richard Wright. Stuntman Ronnie Rondell, the man on fire on the album’s cover, also turns up to share his memories of the photo shoot. This is another fascinating installment in the story of an eminently important band.